Turmeric is a root/rhizome, a golden-colored spice that belongs to the ginger family . Widely used in India for different purposes. The words Turmeric and Curcumin are usually used interchangeably but Curcumin is an extract from Turmeric root, which gives the yellow color to the spice and has several healing properties. Different methods are used to extract Curcumin from Turmeric. Turmeric contains various ”curcuminoids” and Curcumin is one of them. Curcumin is a whole Pharmacy in itself and is used to treat several health conditions. Extensive research is being carried out on Curcumin in the western world for its healing properties.. This spice has always been revered in India since thousands of years. But ,it is very unfortunate that the healing properties are unknown to majority of the current generation and the knowledge is slowly getting lost. Hopefully the research that is being carried out in the western world will bring to light the potency of Turmeric and thereby heal the world. Here is an attempt to describe how Turmeric has been in use since centuries in Indian Customs and traditions. A few drops of water is added to Turmeric powder which is then shaped into a small solid cone . During Hindu festivals this form is worshiped as ”Lord Ganesha” , the remover of all obstacles. It is a fact that none of us wish to face any obstacles in whatever activity we do/take up. This is a method of reinforcing our will power and also to invoke the blessings of the almighty. During Fridays, festivals and other auspicious events, Turmeric paste is applied on the threshold of the main entry door of the house and all other doors that lead outside the house. This ensures that insects and ants do not enter the house. Now a days this is done away with by using paints. Beautiful designs of flowers and leaves are drawn using colourful paints. A married woman gives Turmeric root/powder along with ‘kumkum’ to other married women (neighbors, relatives , friends etc), during festivals after inviting them into their homes. This is done as a blessing and good wishes for the long life of the woman and her husband . Wedding preparations start with the making of Turmeric powder at home. An auspicious day and time is chosen for the event. A few women (relatives, friends neighbors) gather and use a mortar and thistle to crush the dry Turmeric root and symbolically prepare Turmeric powder. A lot of Turmeric powder is used during Hindu weddings. There are a minimum of 5 rituals, spread over a few days , which require the use of Turmeric powder. Haldi Ceremony is a very important part of a Hindu wedding. The bride and groom are smeared with a paste made by mixing Turmeric powder , sandalwood paste and rose-water, in their respective homes , couple of days before the wedding. Relatives friends and neighbors gather and make it a fun event.The Bride and Groom get a beautiful glow on their skin 🙂 . . This is repeated three times on three consecutive days. A natural beauty treatment instead of going to a beauty parlour or a Spa. The bride and groom wear clothes that have been dipped in water that is mixed with turmeric powder . The cloth then gets dyed with a light yellow color. Turmeric powder is mixed with rice which is then called ‘Akshintalu / Akshatalu ‘. These Akshintalu are used during puja and also used to bless others by sprinkling a little on top of the head of the one taking blessings who bows down and touches the elders feet. In South Indian weddings , this rice is taken with cupped hands by the bride and groom and is poured on top of each others head during the wedding ceremony. A long thread is smeared with Turmeric paste and a Turmeric root is tied at the center of this thread. During the wedding ceremony the groom ties this thread around the neck of the bride with three knots. An Indian kitchen is incomplete without Turmeric powder in its spice box. Almost all Indian recipes contain Turmeric powder.Thus ensuring that turmeric is taken everyday in our diet. Turmeric also enhances the color of the dish. The anti bacterial properties of turmeric prevents food from decaying quickly. Turmeric powder is Mixed in milk and consumed in order to treat coughs and colds. Turmeric is supposed to be good for the Liver and digestion. Turmeric is applied to bruises as it is an antiseptic. Small balls are made with wet Turmeric powder. A few of these are consumed in order to reduce menstrual cramps . Turmeric is a blood thinner and reduces cholesterol. Helps in controlling Blood Pressure. It is anti-inflammatory. Inflammation is the major reason for most of the chronic diseases including Diabetes , Cardiovascular diseases , Arthritis , Cancer etc. Curcumin induces apoptosis in tumours . It induces cell death in cancerous cells thereby stopping the multiplication of these cells. A lot of research is being carried out and there is sufficient proof that this property of Curcumin can treat almost all types of Cancers. Many South Indian women apply turmeric paste to their feet every Friday and during festivals and other religious events. Being an antiseptic it protects the feet from infections and cracked feet. Turmeric paste mixed with other items like milk, chickpea flour etc is applied as a face mask to get rid of acne, pimples and other skin problems . It is also an excellent exfoliant and gives a glow to the skin. No wonder Turmeric has always been given a lot of importance in Hindu customs, traditions and rituals since a long time and is treated with piety and respect. It is highly recommended that everyone include more Turmeric in their diet. It is also advised to prepare your own Turmeric powder instead of using the store-bought powder which is usually adulterated. I have been using Curcumin every day since Jan 2014 , to fight Multiple Myeloma. Currently not using any other drug. Hope to manage my condition as long as I can. Categories: Cooking, Curcumin, Health, turmeric, Uncategorized | Tags: Beauty, Curcumin, Customs, diseases, Health, hindu, India, pasupu, traditions, treatment, turmeric, wedding | Permalink. I was due for a BMA test in a week and was a bit nervous and had this strong urge to spend a few days in our village before I went for the test. Here are a few pics from this visit. These pics give a glimpse of life in a village. 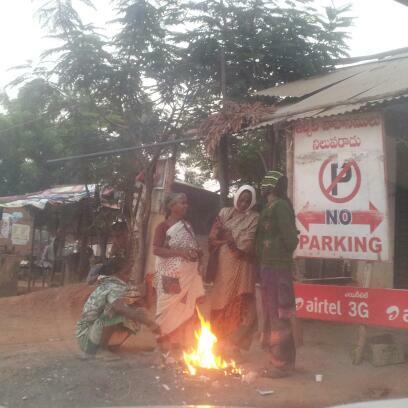 The winter months are here and village folks warm up with a bonfire in the early hours of the morning. A group of women are warming up while discussing the days chores. A dish TV antenna has been fixed to a dried trunk of a Palmyra tree. A Palmyra tree is one of the most useful trees in this part of the country. The leaves of the Palmyra tree are used as a roof for their huts ,cattle sheds and fence. It is called a thatched roof and can be seen in the pic. The palmyra fruit is relished during summer months. Palmyra Toddy is a popular drink in the villages. The cling clang sound of sheep bells is so soothing . The sounds from these bells , the cool evening sea breeze (this village is around 8km from the sea) and chirping birds can take us to a meditative state. This is bliss !! I am back in Hyderabad now and as I close my eyes I transport myself to that scene and location :). 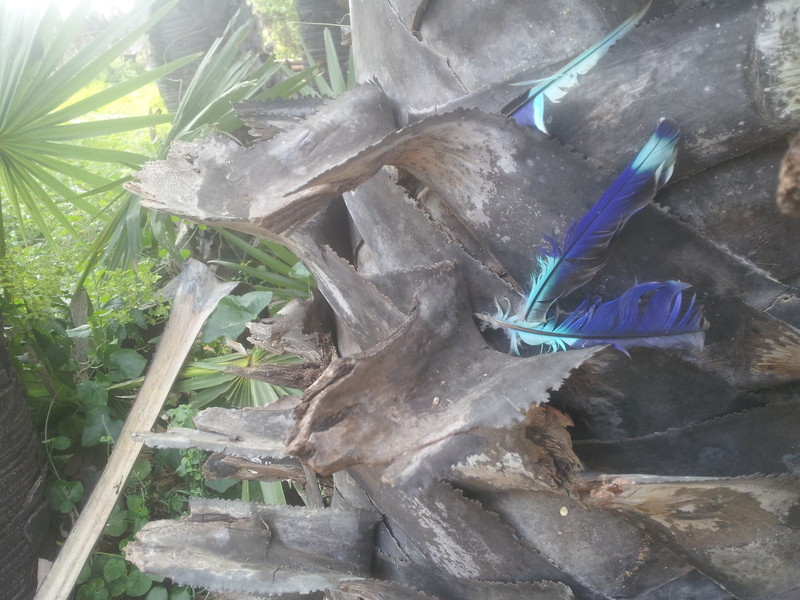 Found a few feathers of the ‘Indian roller stuck on the trunk of a palmyra tree. The bird must be nesting on the tree. A very beautiful bird, often seen flitting from one palmyra tree to another ,is usually found near agricultural fields in this part of the country. The bird appears mostly brownish with streaks of blue when perched . While flying its light and dark blue feathers are open and the bird appears very bright ans beautiful. Found a link to a video of the bird in flight. 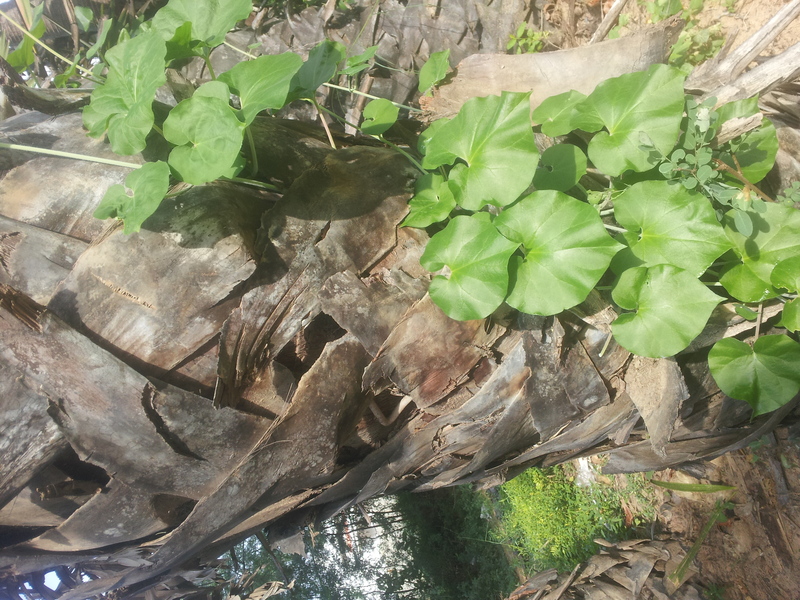 Love the contrast of a tender climber climbing up the rough trunk of a palmyra tree. Rural atmosphere is very peaceful , less polluted and life is very simple . A village appears to be another far away planet far far away from the noisy Urban world. Feeling energized and rejuvenated after spending a few days there. I am also done with my BMA test and awaiting the results. 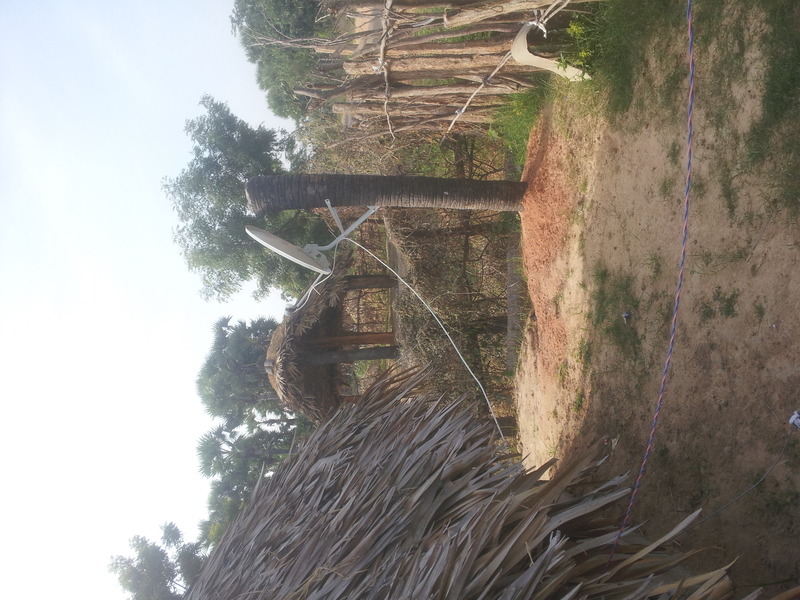 Categories: village | Tags: India, pictures, village | Permalink.